In honour of Saint Mary Magdalene, the Whirling Stilt Dancers festival is celebrated in July. Although the main day is the 22nd, this “fiesta” last three days. Besides, the Stilt Dancers appear again in May and September. On the one hand it seems that walking on stilts was common in this area of the country because it was a very damp zone, and the tall grasslands doesn´t allow the farmers to see the cattle. On the other hand the farmers used to dance to the virgin asking for the crops. 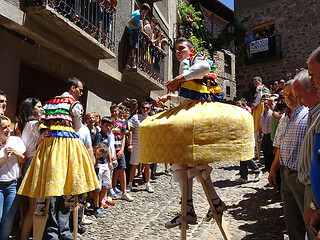 Both traditions were brought together; every year in July eight dancers on stilts of almost 50 cm high whirls down the stairs of the church and the cobbled street that leads to the town hall. The day starts with the parade of the dancers and musicians at 10 am. At 12 pm there is a procession during which the dancers, always backwards, dance to the virgin along the way. Two hours later after the mass, the whirlings start.